Heavy and bulky, today’s car seats are a pain to carry around outside the car. 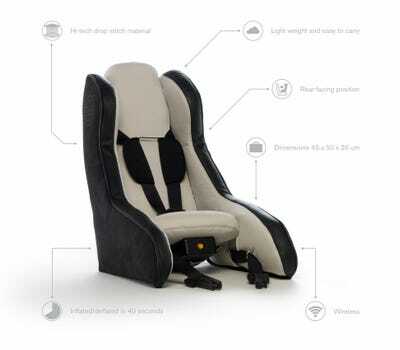 Now parents can thank Volvo for making a seat that’s safe, light, and easy to pack. Volvo says the new rear-facing seat concept inflates in 40 seconds using an integrated pump. It comes in at less than 11 pounds, about half the weight of a contemporary car seat. Deflated, it fits neatly into a backpack, especially convenient for parents tired of checking their baby’s car seat as luggage when flying. The seat is made with a fabric that can sustain high internal pressure, originally developed by the military as part of an effort to create an inflatable aeroplane (that never worked out), now it’s used by the boating industry, Volvo says. There’s no word on when the inflatable seat could come to market, but hopefully Volvo moves quickly.